In conjunction with the Battle Ground Village Outdoor Market’s season opening, fans of Pasta GiGi’s were finally able to enjoy the unveiling of their new location in the round of Battle Ground Village. Saturday, May 3 marked the soft opening of Battle Ground resident, Kathy Aikens’ long-standing dream to preside over a full service Italian restaurant with touches of French influence sprinkled about. Aikens purchased the previously-owned Pasta GiGi’s in June 2012 and has grown it from a market and sit-down lunch spot for 12 to a lunch and dinner establishment that now has the capacity to service 50 diners comfortably between the downstairs space, upstairs seating and inviting wrap around outdoor balcony. Additional tables will accommodate 14-16 patrons just outside the front doors. The newly-designed menu was created by Aikens. 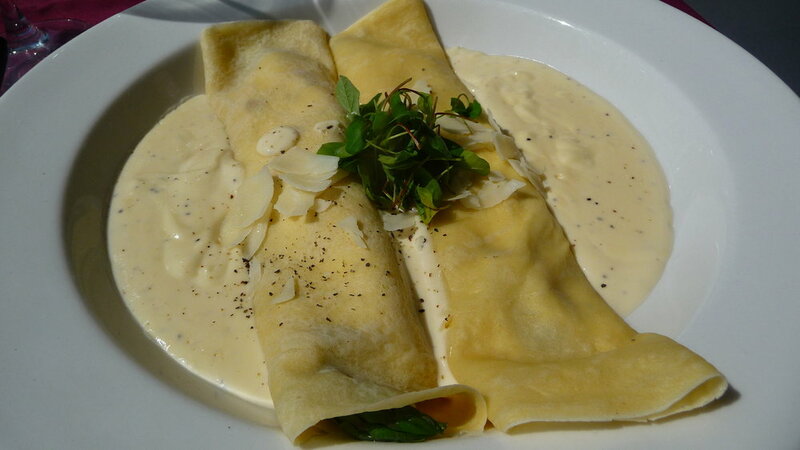 All the recipes are hers and Pasta GiGi’s signature dish is crespelle - an Italian crepe. Aikens’ is filled with roasted asparagus, ricotta cheese, sautéed mushrooms and it’s served with a traditional Italian white sauce. Other offerings include lasagna with a Béchamel sauce, spaghetti, fettuccine alfredo, shrimp scampi as well as gluten-free and vegetarian options. Pasta GiGi’s has gained approximately 400 square feet by moving from its smaller storefront on Rasmussen Road in the Battle Ground Village. In that space, however, Aikens experimented with monthly dinners and it was from these events that the new location was birthed. “The customers seemed to be so accepting of my dinners being offered in town. Just through the comments of my guests from those dinners and pre-booking at the dinner for the next one, it gave me the urge to open up and experience Pasta GiGi’s every night of the week…except for Sunday,” Aikens said. A feature of their new space is the premium outdoor seating. Plans are to extend the use of the balcony on cooler days with heaters. Pasta GiGi’s also intends to showcase the farmers market vendors by featuring local produce in dishes whenever possible. They’ll be running some picnic specials for Movies in the Park like box lunches and box snacks as well as having the ice cream bins open for warm evenings. A wine staging area is located upstairs and Aikens plans to host wine tasting events and promotional wine tastings featuring area wines paired with some of their appetizers. One of the first collaborations will be with Emanar Cellars, the Spanish-style tasting room also located in the Battle Ground Village. A selection of beers will be on tap, as well, and the space is available for private parties. Their well-received lunch and gourmet sandwich menu is still available. The menu has simply been expanded upon to include more traditional Italian entrees for dinner. The French influence comes into play with some of the sauces being used, particularly the white sauce. As Aikens explained it, on the border of France and Italy butter and olive oil marry in sauces as opposed to one or the other. Aikens’ background in cooking can be traced back to watching her parents and grandparents cook when she was young. Her grandfather was a passionate cook and his personal recipe collection is one of her fondest treasures. Several years ago she enrolled at Chef’s Studio in Portland (now known as Good Keuken) where, under the tutelage of Robert Reynolds, she studied Italian and French cooking. Working alongside Aikens in the new location is her Sous chef, Paul Durazo, who hails from Vancouver, is a graduate of the Clark College Culinary Arts program and worked at the Radio Room in Portland for a number of years as well as McMenamins. General manager, Keith Stackhouse, is a Yacolt resident with a culinary background and corporate history of several restaurants including Outback Steakhouse. Pasta GiGi’s will continue to sell retail market items like balsamic vinegars, chocolates, oils, Pappardelle's Pasta, salts, seasonings and specialty foods along with an extensive selection of wines and micro brews. New hours of operation are Mon-Thu 11 a.m.-2 p.m. and 4-9 p.m. and Fri, Sat 11 a.m.-2 p.m. and 4-10 p.m. Pasta GiGi’s is now located at 819 SE 14 Loop, Suite 108, Battle Ground. Phone (360) 624-1268. Find them on the internet at www.pastagigis.com as well as Facebook.